Snowdrop (official: Galanthus) blooms are the first hope of spring. The very first will appear in late January if you know where to look. So if you’ve conquered the PR spin that is Blue Monday and are at one with the highs or lows of this year’s New Year’s Resolutions, don’t be afraid to look down, because things are looking up. Peeking through the soil are the first signs of longer, sunnier days and the prospect of idyllic, Instagram-filtered woodland vistas that you might associate with snowdrop walks. There could be a secret woodland spot near you perfect for a snowdrop walk. Or you may need to find a formal garden or National Trust property to see a snowdrop garden in full flower. 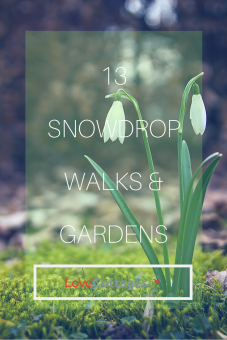 Either way, this list of snowdrop walks and snowdrop gardens is just a starter for ten. If you find some more wondrous than these, please share! 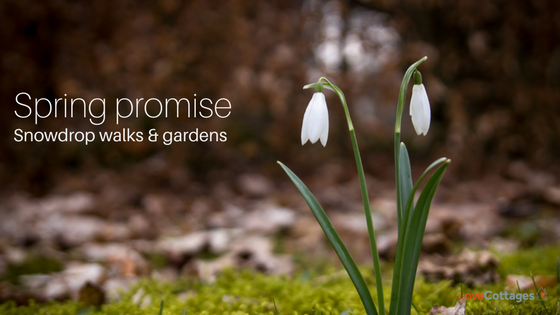 Start your snowdrop walk in Cornwall, where first hints of spring arrive first. Trengwainton Garden is one of Cornwall’s exotic gardens. The snowdrops greet you as your wend your way down the drive and along Long Walk. Fountains Abbey in Yorkshire tops pretty much any list of snowdrop walks and gardens. The plants have been here since the 19th century. This mystically beautiful spot draws crowds on the best of days thanks in part to its prettiness and its World Heritage status, and in part to its Harry Potter associations. Yet when the snowdrops are in bloom, there’s an added hint of magic we simply love. At Lacock Abbey in Wiltshire you can join a walk with the head gardener on set dates that takes in the snowdrops as well as their poor neighbours. In other words, any other winter bloom. By the time the Peter Rabbit movie premieres in March, the snowdrop garden at Beatrix Potter’s Hill Top in the Lake District will have had its moment for 2018 and attentions can turn to Hollywood. Although the beautiful gardens at her 17th century farmhouse will always draw the crowds. At Bodnant Garden in North Wales they plant an extra 20,000 snowdrop bulbs every year. You can help with the planting during February half term then head back next year to see the bulbs in full bloom. The grounds of Kingston Lacy near Wimborne Minster in Dorset present a stately afternoon’s wander. Steer yourselves down Lime Avenue to Nursery Wood for a sea of snowdrops at your feet while the sun (hopefully) casts its wintry rays through the branches of this pretty arboretum. The glory of this scheme is that it enables the general public access to private gardens on designated days. So you’ll need to check dates, but you’ll discover gardening wonders galore. For one day only at the end of February skip around the snowdrop carpeted circular walk at Bagthorpe Hall in Norfolk. Fill your boots with homemade soups and cream teas to make it a stonker of an outdoors day. Bramdean House in Hampshire is famous for its mirror image herbaceous borders, which may well distract from snowdrop carpet. Open one Sunday every other month, this is one to plan into the diary and watch as the seasons alter what greets you when you get there. Snowdrop Day at Gable House in Beccles, Suffolk shows off our favourite spring flower amongst its seasonal flora mates. There’ll even be species to buy and take home to start your own glorious garden. We don’t wait for an invitation to visit the pretty and sprawling market town of Sherborne on the Dorset Somerset border, but we will put Sherborne Garden’s snowdrop open days in the diary for a privileged wander around 4.5 acres of rolling gardens and plentiful stopping spots for a rest while you take in the view. Pembury House in Sussex is one of those examples of snowdrops in an everyday garden. Spot them dotted around the base of trees, peeking through borders, claiming ground beneath larger shrubs. Yes, it’s a grand garden, but it’s not a formal, manicured garden, which leaves us feeling that anything is possible. Snowdrops are not native to the UK and nobody really knows how they first arrived here. We’re grateful all the same for this delicate gem that gets us back on track for summer and out and about in spring. Make a weekend of it in a Love Cottages holiday home.